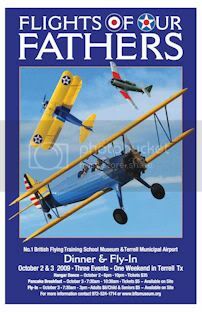 Come out to Terrell, Texas on October 2nd & 3rd for the Flights of our Fathers Fly-In. Below is the event poster and link to their site(not my work). I have the link posted to the right that will remain up until the event. The Fly-In isn't the only happening in Terrell. On Saturday September 26th, Terrell will honor home town success story Jamie Foxx. A motorcade will transport Mr. Foxx from City Hall to Memorial Stadium. If you cant get tickets to the event at the stadium, come out to Terrell and line Moore Ave. Its not often you get a chance to see an Academy Award winner up close. A facebook friend posted the You Tube clip below and I was amazed by this ladies voice. Her name is Ruthie Foster, and she is from Texas!